Drive through Portland at sunset and you start to wonder if the city’s notoriously bad traffic can’t be at least partially blamed on Mt. Hood’s picture-worthy silhouette. Sometimes it’s just so darn pretty it’s impossible to stop your eyes from drifting eastward. But be warned: stare too long and it starts to issue forth a kind of gravitational pull, dragging even the most reluctant person into its orbit. Fortunately, there are enough recreational opportunities on the mountain to satisfy just about any outdoor passion: hiking, boating, backpacking, rafting, climbing, year-round skiing, horseback riding, fishing, and (according to me, and Stanley Kubrick) the most iconic mountain lodge in the world: Timberline Lodge. Views of Mt. Hood are a ever-constant and always-changing along the Timberline Trail. The lodge that became the face of The Shining shares its name with a destination that belongs on the bucket list of every backpacker: The Timberline Trail. Circumnavigating Mt. Hood over 40 miles, many of which come fully-loaded with up-close-and-personal views of the craggy faces and glaciers that make up the summit, is one of the very best ways to experience the mountain. It’s also the perfect training ground for a longer hike. Every year, hikers descend on the mountain as a trial run for a larger challenge, whether it be the 93-mile Wonderland Trail circumnavigating Mt. Rainier or the 2,600-mile Pacific Crest Trail. 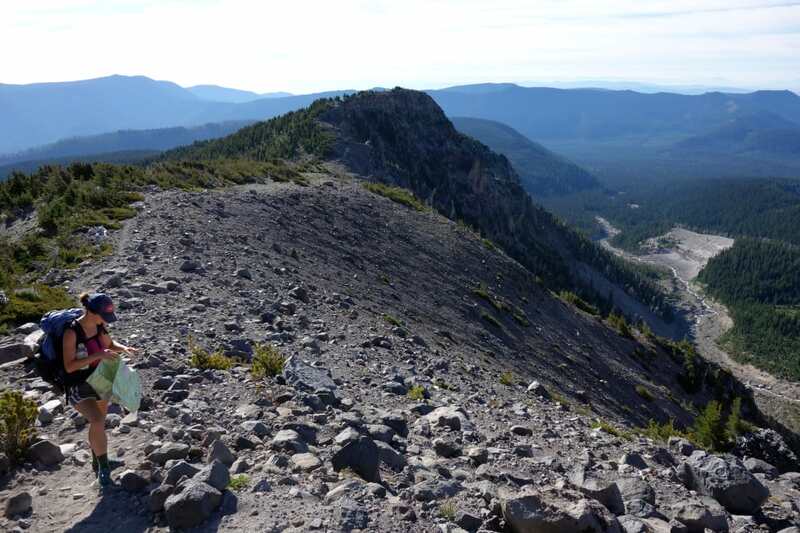 And even if the trail doesn’t send you into a wanderlust for something harder and longer, the unique challenges of the Timberline Trail ensure you’ll have plenty of bragging rights to enjoy over your post-hike beer. The Timberline Trail is well-marked, but not necessarily for a thru-hike. A map can make a world of difference. The Timberline Trail is well-marked, but not necessarily for a thru-hike. Signs more often indicate what you are hiking toward, rather than what trail you are on. Bring a map that provides a reasonable level of detail so that you can track which trail leads to which destination. There are also no designated campsites on the Timberline Trail, giving you the freedom to hike as many or few miles as you want each day. If you’re new to longer hikes, this is a good opportunity to get some experience reading maps for campsite potential and scouting out your options each evening. 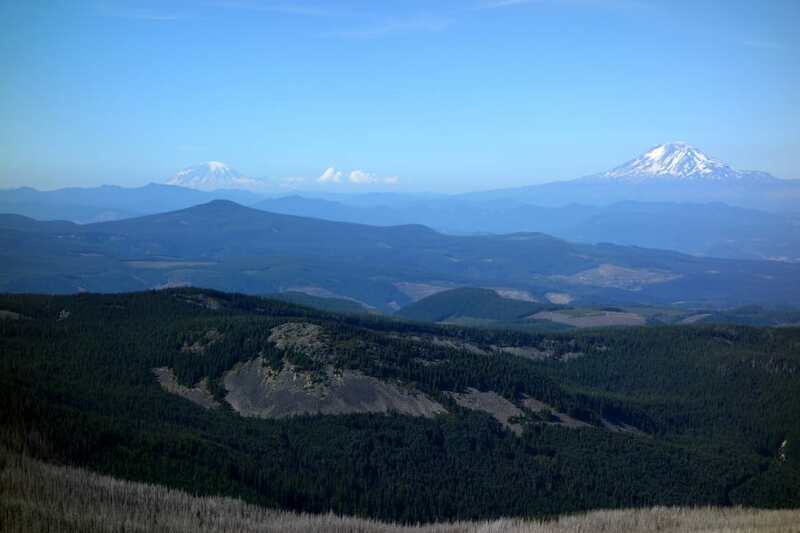 For more detailed beta on the trail, including water sources and established campsites, the Oregon Hikers webpage provides an excellent blow-by-blow of what to expect on the hike. Duration: During a 2016 thru-hike of the Timberline Trail, my husband and I met a trio of ultra-runners completing the 40 mile loop in a day. For the rest of us, an average of 7 to 20 miles a day (or 2-6 days in total length) might be more reasonable. The best season for a thru-hike of the Timberline Trail is July through October. Seasonality: The best season for a thru-hike of the Timberline Trail is July through October. An earlier start will mean more available freshwater coming off the mountain, but more dangerous creek crossings, while later in the season will see safer river crossings, but longer distances between fresh water sources. In August, expect the western side of the mountain to transform into a fast-packing corridor, as northbound Pacific Crest Trail hikers wrap up 460 miles of Oregon hiking on their way to Cascade Locks and the Bridge of the Gods. 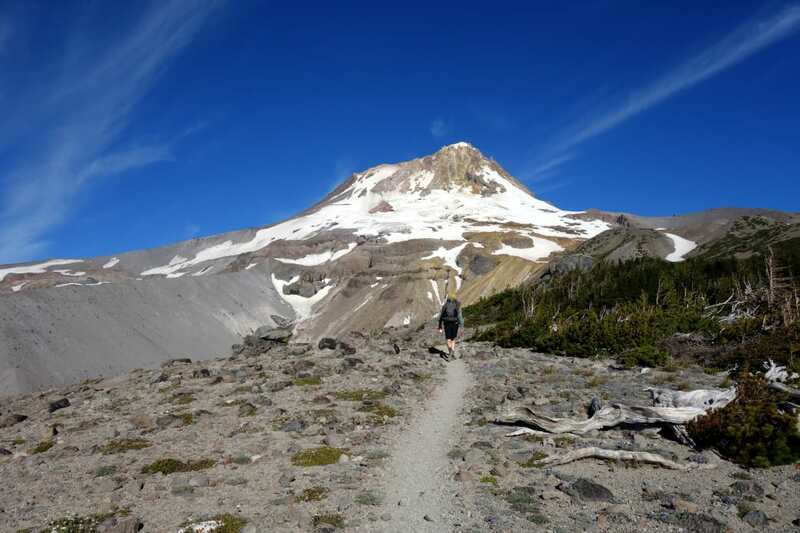 Resupply at Timberline: If you’re planning a hike on the longer side, you can lighten your load by taking advantage of a service that Timberline Lodge provides to PCT thru-hikers: holding resupply boxes. Starting from the Cloud Cap Trailhead puts the lodge at about the midway point, the perfect spot to send half of your food, as well as other incidentals, in advance. Of course, it also gives you an excuse to stop off for a quick meal in the lodge itself. To send a box to the lodge, follow the instructions provided on their website. 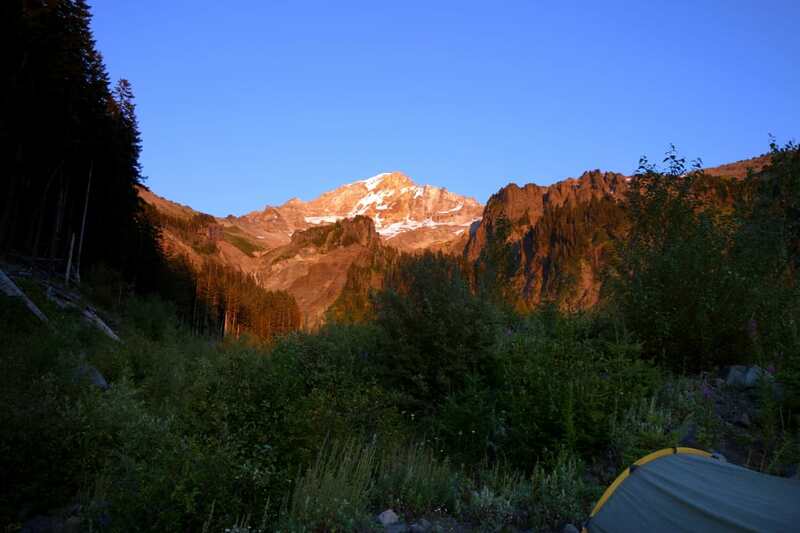 Or Stay the Night: If you’re planning on completing the trail in four days or less, I highly recommend starting from the lodge and booking yourself a room for your final night (overnight parking is available nearby). This is really one of the most beautiful lodges anywhere in the park system, and well worth taking the time to explore its Cascadian architecture, composed of local materials like Douglas fir and ponderosa pine. Motifs celebrating the cultural and natural history of the mountain can be found throughout. Plus, the lodge has an amazing all you can eat breakfast buffet. The sun sets along the Timberline Trail. Permit: One consideration you can cross off your list is getting a permit. For the time being, the only permit you need to hike the Timberline Trail is a self-issued permit at the trailhead. River Crossings: Hike the Wonderland Trail around Mt. Rainier and you’ll get a sampling of different strategies for erecting bridges over glacial streams: wooden bridges erected high above raging rivers, suspension bridges that span a hundred feet or more, and, of course, seasonally constructed bridges, manufactured on-site out of fallen trees washed up on shore. The Timberline Trail dispenses entirely with these niceties, leaving hikers to encounter rivers as nature intended. A few of the rivers you can rock hop, but many more must be forded. If you don’t think a river is safe to cross, don’t cross it! 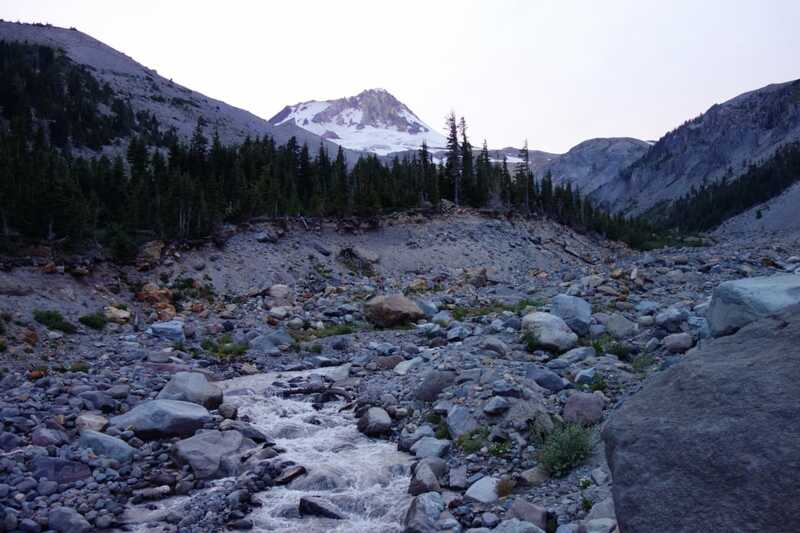 Especially during early season runoff, the rivers around the Timberline Trail can be dangerously high, and have resulted in fatal accidents for backpackers in the past. Expect to ford some waterways along the Timberline Trail. 1. Hike with a friend. If you can’t hike with a friend (or don’t want to), make a plan with the hikers near you to wait at the more technical river crossings. That way you can partner up during the crossing if the water is higher than your knee. 2. Don’t cross at the trail. The safest and easiest crossing point is rarely where the trail crosses the river. Scan or explore upstream and downstream to find the best spot. Dusk along the Timberline Trail. 3. Bring a trekking pole. Even if you don’t normally hike with trekking poles, bring along at least one. Having two points of contact at all times as you cross will go a long way toward helping you stay upright. 4. Wear shoes. The rivers coming off of Mt. Hood are filled with glacial silt. You won’t be able to see the bottom, and after a second or two, the icy water will have numbed your feet enough that you won’t be able to feel a sharp or slippery rock. Bring along a pair of Chacos or water shoes to wear during river crossings instead of your boots or trail runners. They are worth the weight. Eliot Branch Crossing: One particularly violent washout occurred in 2006, when a torrential downpour led to massive flooding on the Eliot Branch Crossing, and a section of trail was wiped clean. 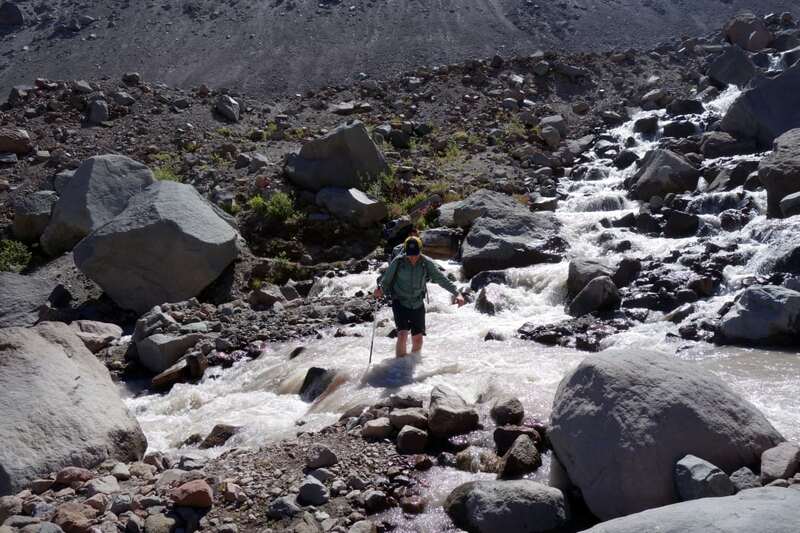 For the next decade, intrepid hikers either shuttled around the closure, hiked up to the Eliot Glacier to cross the river over snow and ice, or followed a lightly cairned route down the talus slope. After crossing the river, a perilously secured rope was available to climb up the unstable 300-foot talus slope on the other side. 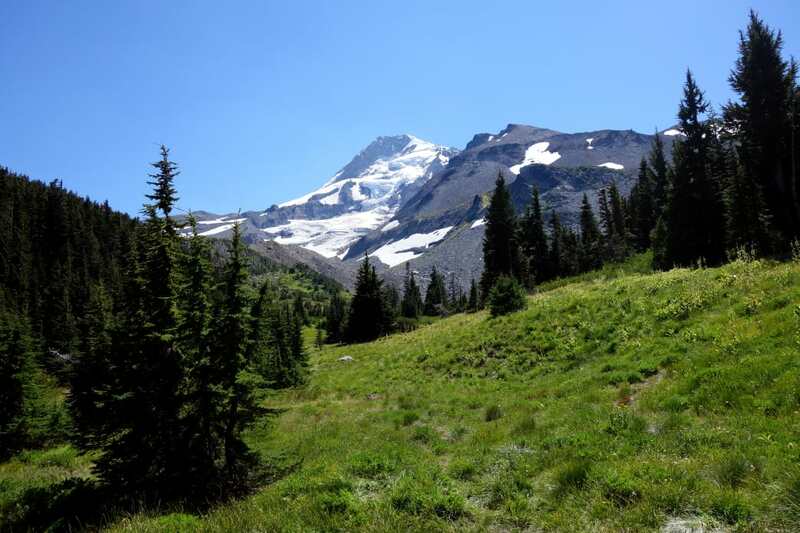 Picture-perfect panoramas along the Timberline Trail. The good news is that the forest service completed the rebuild of the trail in late 2016, and now hikers have a safe route down to the river and then back up onto the ridge on the other side. But, of course, there’s still no bridge. That’s just how it goes on Mt. Hood. Is This the Most Scenic Section of the Appalachian Trail? Think You Could Paddle the Longest Canoe Trail in the Northeast?